George Dudley Craig was born in Bangkok, Thailand, on 13 September 1914. He was educated at Winchester College and Pembroke College, Cambridge, where he continued a BA in Law in 1936 and a MA in 1940. Before the war he practised in a solicitors’ office. He joined 607 (County of Durham) Squadron, AuxAF in 1937 and was commissioned to Pilot Officer on 28 May 1937. The Squadron was at the time based at Usworth, near Sunderland. He was promoted to Flying Officer (AuxAF) on 28 November 1938. The Squadron was re-equipped with Gloster Gladiators and Craig flew his first Gladiator (K8030) on 8 January 1939. 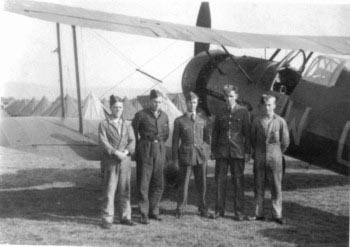 Flying Officer George Dudley Craig with his ground crew and Gladiator “L” during summer camp 1939 at Abbotsinch. On 24 August 1939, he was called to full-time service as a Flying Officer. On 10 September, 607 Squadron moved to Acklington, Northumberland, so that runways could be laid at Usworth. 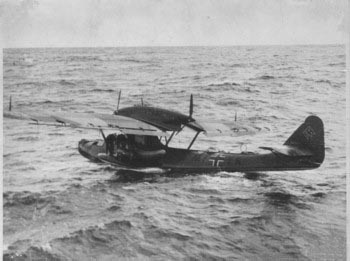 At 12:45 on 17 October ‘Blue’ section from ‘B’ Flight of 607 Squadron was scrambled to seek German seaplanes that had been reported off the coast. Flight Lieutenant John Sample (Gladiator K7995/AF-O), Flying Officer Craig and Pilot Officer William Whitty (Gladiator K8026/AF-L) headed out to sea, where at 13:30 they intercepted a Do 18 flyingboat at 1,500 feet some 25 miles of the coast. Sample led the flight in a diving attack from 8,000 feet and each of the Gladiators carried out three individual attacks from astern. Bits were seen flying off the Do 18 but it continued to fly, trailing smoke and descending out to sea. With ammunition expended and fuel getting low, Sample led his section back to Acklington. On 5 January, he suffered a broken tailwheel on his Gladiator during landing at Mons-en-Chaussée after an affiliation exercise with Lysanders. The aircraft was repaired. On 7 February, he wrecked Gladiator K6137/Z after a forced landing following engine failure on take-off at St. Inglevert. The aircraft overshot the landing and ran into a hedge near the airfield. Craig was unhurt. On 26 March 1940, he lost his bearings in bad weather and overturned Gladiator K7967/AF-L in a forced landing at Athies, near Mons-en-Chaussée. Craig was unhurt. The Ju 87B, T6+MS flown by Oberleutnant Karl Janke, crashed near Visé where the injured pilot was captured by French troops. Later during the same sortie Plinston claimed an Hs123 from 5(S)/LG2. On 16 May, Craig was flying a frontier patrol in Hurricane ‘M’ in company with 615 Squadron. They were bounced by Bf 109s and a turning dogfight ensued in which Craig reported that the ‘floored one’. Next day, in the vicinity of Le Cateau, he attacked a Do 17, which he noted ‘crashed in flames’. This was followed by a He 111 which, when he was about to attack it, “crashed before he fired a shot”. The squadron suffered heavy losses and lost two commanding officers in short time. 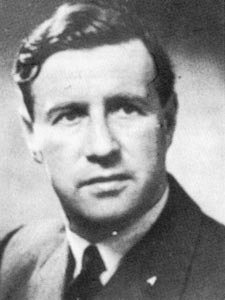 As senior pilot, Flight Lieutenant John Sample was given command of the remains until the squadron was ordered to withdrawn from France on 21 May 1940. The Squadron re-established at Croydon on 22 May. Craig served with 607 Squadron throughout the Battle of Britain. On 1 August he states that he downed a Do 17 off the North East coast. On 15 August the Luftwaffe launched its one and only massed attack on the North East of England. At 13:15 the 607 Squadron was airborne and after some flying made contact in the area of Whitley Bay. Flying Officer Craig, flying in ‘Green Section’ in Hurricane ‘L’ managed to attack two He 111s, which he claimed shot down into the sea. He then attacked a third, which he chased out to sea for some 50 miles before being forced to return due to oil pressure problems. It seems that he was credited with two probably destroyed (one of them being credited as a ‘Bf 110’). In the same combat was Flying Officer William Whitty credited with two damaged Bf 110s off Newcastle. On 3 September 1940 he was promoted to Flight Lieutenant. On 8 September 607 Squadron moved to Tangmere, Sussex. Craig encountered an He 111 on 14 September and carried out several attacks, but despite seeing pieces falling off, the bomber eluded him in cloud. When 607 Squadron left for Scotland, Craig remained as a controller. When he re-joined the squadron he did it as its commanding officer on 1 April 1941 when it was based at Skitten, near Wick, Scotland. On 20 August 1941 the squadron re-based to Martlesham Heath, Suffolk. At this time they had been re-equipped with Hurricane IIs. The squadron was then moved to Manston, Kent to fly ’Rhubarb’ missions against the French coast. The 607 Squadron flew its first mission on 30 October, Craig leading them in Hurricane ‘L’. He flew a second sortie on 2 November against shipping in the Channel. He was shot down by AA in Hurricane ‘L’ whilst making a low-level attack on Le Touquet airfield on 4 November 1941 and captured. After a short spell at Dulag Luft, near Frankfurt, he was moved to Stalag Luft I near the Baltic town of Barth. On 15 January 1942 he attempted to walk out of the prisoner camp together with former 607 Squadron pilot Willie Turner, disguised as German guards, but was unsuccessful. 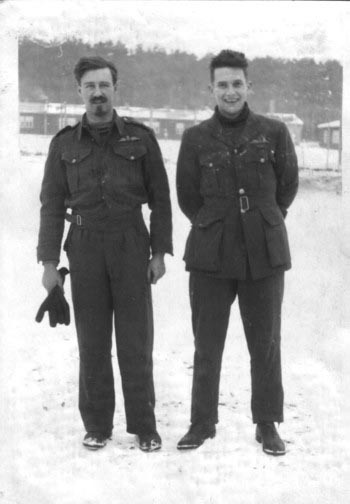 Dudley Craig (left) and Squadron Leader Willie Turner DFC at Stalag Luft I in 1942. He was then sent to Stalag Luft III. While there he served on the intelligence committee and any ‘free tme’ was spent exercising, making use of a vaulting horse. Beneath this box, two fellow prisoners tunnelled for freedom in a legendary escape, as immortalised in the 1950 film The Wooden Horse. Along with other known escapees and attempters, Craig was moved to Oflag XXIB at Schubin. Craig was one of 36 officers who tunnelled their way out from this camp. With Harry ‘Wings’ Day he walked south towards Gneisen but was recaptured by military police after two days. He was then moved back to Stalag Luft III but not the old camp but a new one built to the north. While here he again served as intelligence officer and thus took part in the ’Great Escape’ but did not actually get out of the tunnel. In 1944, courtesy of the Luftwaffe and the Red Cross, he completed his final law exams. As Soviet forces made their advance towards Stalag Luft III, Craig and his fellow prisoners were force-marched to Luckenwald before gaining their freedom. After returning to England in May 1945, he was released later in the year. Craig ended the war with 1 shared biplane victory and a total of 2 shared. He received a Mention in Despatches on 28 December 1945 and was made an MBE on 26 July 1946 for distinguished service whilst a PoW. Craig returned to continue his law practice, later becoming a partner. He rejoined the AuxAF in 1947, firstly in the Secretarial Branch and later in the Fighter Control Branch. He was promoted to Flying Officer (RAuxAF) on 30 May 1947 and to Flight Lieutenant (RAuxAF) on 6 February 1950. He was awarded an OBE on 12 May 1949. TOTAL: 2 shared destroyed, 3 unconfirmed, 2 probables. (b) Ju 87B, T6+MS flown by Oberleutnant Karl Janke, crashed near Visé where the injured pilot was captured by French troops. (c) Claimed in his logbook but don’t verified with official documents. (d) Probably Do 17s from 6./KG 76. Claimed in his logbook but don’t verified with official documents. (e) In some sources credited as a ‘Bf 110’. (f) Claimed in his logbook but don’t verified with official documents.